Thumbnail image is from the IFA website. In the 1970s and 80s, scientists working for the U.S. Department of Defense developed a secret technology for imaging Soviet spy satellites from the ground. One of the consultants, Claire Max, realized the technology could benefit astronomy and pushed for its declassification. The concept of adaptive optics with laser-powered guide stars was finally released to the public in 1991. Adaptive optics (AO) involves the rapid deformation of a mirror to remove distortions from an image. Imagine seeing a rock at the bottom of a clear but fast-moving stream of water. Inverting the jittery, garbled image into a true image of the rock is a significant engineering and computational challenge. First, we need to observe a simple point source behind the same distorting medium. This is where laser guide stars come in. One type of laser lights up a thin layer of sodium at about 90 km altitude. This creates a “guide star” that experiences much of the distortion seen in a true star. Using this information, a deformable mirror can correct the true star’s image in real-time. But large AO systems are extremely unwieldy. They require lots of money and manpower, and lots of observing overhead— it can take several minutes to slew to a target, lock onto a guide star, and initialize a correction loop for deforming the mirror. And yet, in today’s era of “big data” astronomy, AO imaging has become ever more relevant for rapidly-growing datasets. There’s a niche for fast, robotic AO. Recently, the optical scientist Christoph Baranec has done just that by building… Robo-AO. 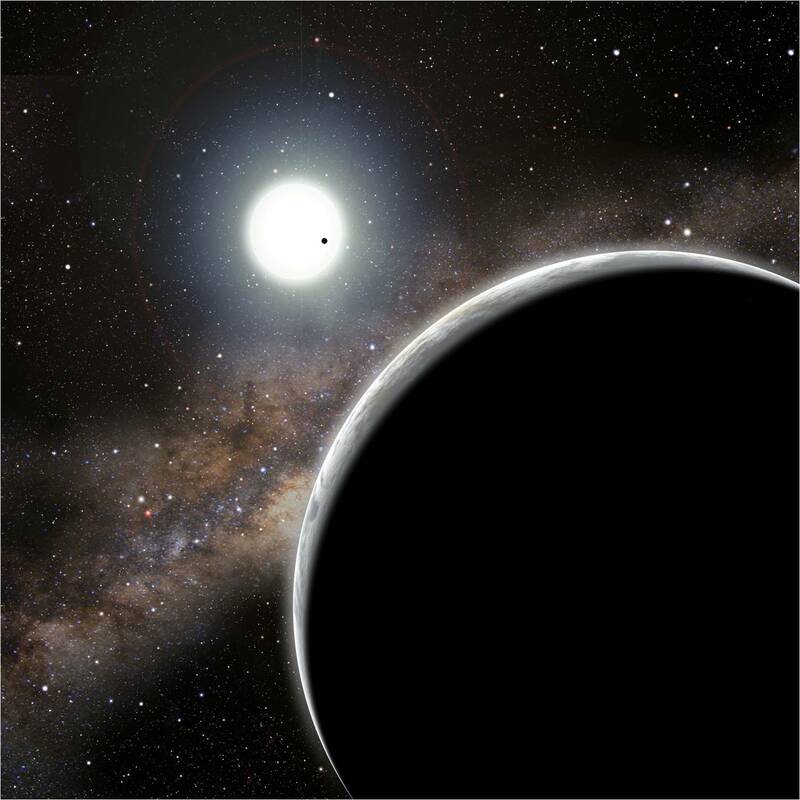 The Kepler space telescope has detected thousands of possible exoplanets transiting in front of their host stars. But the Kepler pixels are huge, about 4 arcseconds across, and there’s always a risk that multiple stars are lurking in a single pixel (Fig. 1). This can lead to false positives (like in eclipsing binary systems), or can dilute real planet signals (where the light from another star will make a transiting planet’s radius seem smaller than it actually is). This calls for AO follow-up. 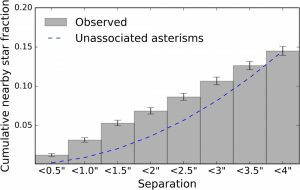 Before Robo-AO, AO follow-up of Kepler objects of interest (KOIs) has been a heterogeneous and incomplete effort using different instruments, reduction pipelines, and analyses. To establish a consistent, complete, and unbiased analysis, Robo-AO has targeted Kepler stars from Palomar Mountain in California and Kitt Peak in Arizona. (Check out an introductory video about the project here, and a time-lapse of Robo-AO hammering targets with a UV laser here.) 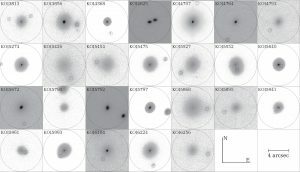 The most recent paper to be published on the accumulating Robo-AO Kepler data reports on 3857 KOI observations, taken at a rapid-fire cadence of 20 targets per hour. Within their ranges of sensitivity, the authors found that about 17% of the stars had stellar companions within 4″. In total, they found 610 stellar companions to 559 KOI stars. The authors calculate that if the candidates orbit the target star, then the planet radii have to be multiplied, on average, by a factor of 1.08. If they orbit a bound stellar companion, their radii increase by a factor of 3.29! A total of 35 supposedly-rocky planets have newly-revised radii of >1.6 Earth radii in either scenario, meaning that they are gaseous giant planets, not rocky ones. 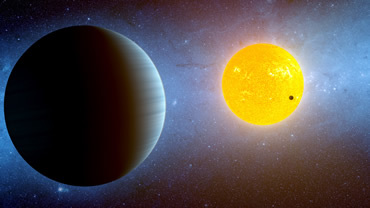 Models suggest that stellar companions could severely perturb planets’ orbits or fling planets out of a system entirely. To determine the effect of stellar companions on planet formation, we first have to determine which of the KOI companions are gravitationally bound with each other, and how many are unbound but are just along close lines-of-sight. The authors argue that if companions were unbound, then we would expect a field of view twice as large to lead to about four times as many found companions. But in fact, found companions increase linearly, suggesting that some of the stars are indeed bound (Fig. 3). The authors are preparing another paper that will take a deeper dive into the nature of these companions, which will bring us closer to understanding the effect of multiple stars on planetary systems. In the meantime, Robo-AO is continuing to pursue many different science cases. And a southern Robo-AO unit at Cerro-Tololo is under development, as is a Robo-AO 2 instrument in Hawaii. Soon we can observe most of the sky with Robo-AO’s automated gaze. Unless, that is, the robots finally rise against us.